Consisting of 855 square miles of protected land; rugged hills, softly flowing streams, glittering tarns and wide open lakes. The Lake District is Britain’s most popular National Park, a place to escape the hustle and bustle of modern life and live slow for a while. Indeed, phone service is sparse here and there are no major towns or cities within the park - the closest being Carlisle and Lancaster to the north and south respectively. The Lakes have a vibrant outdoor-adventure scene, with climbing, hiking, camping, fishing, cycling and water-sports all popular and easily accessible. Adding to that a number of pretty villages and towns, country pubs, cosy cafes and artisan restaurants, as well as a strong literary and cultural scene, and the English Lake District certainly becomes the perfect place to escape for a weekend. So load your car with boots and bikes, a tent, sleeping bag and a map and head to this beautiful natural space in the corner of England, a place where time goes slow and the weight of the world feels so very far away. The Langdale Pikes is one of the most popular walks in the Lake District, covering 8 miles of ground and a total of 8 fells: Pavey Ark, Pike of Stickle, Harrison Stickle, Thunacar Knott, High Raise, Sergeant Man, Tarn Crag and Blea Crag. Starting from Dungeon Ghyll, this is a strenuous walk that begins with a steep ascent to the 2000ft summit of Pavey Ark, before continuing over the remaining fells and descending into the stunning Langdale Valley. Craggy hilltops, open moors and a patchwork valley down below, the Langdale Pikes is an incredible, must-do hike in the Langdale area of the Lake District. Getting there: From Ambleside, head towards Great Langdale and park in the pay and display carpark at New Dungeon Ghyll to begin the hike. Hike: This is an 8 mile strenuous walk which can be followed by using OS map OL7 Lake District, South East. Gear: Wear walking boots and bring a warm jacket and raincoat as the weather can be unpredictable at any time of year atop the Pikes. Food & Drink: Bring plenty of food and water on the walk, on your return both the Old Dungeon Ghyll and New Dungeon Ghyll have plenty of options for hungry hikers. The National Trust cafe and bar at Stickle Barn has a great variety of food and drinks. If you’re looking for a remote campsite in the heart of the Lakes, the National Trust campground at Great Langdale would certainly be the one we recommend. Quietly nestled at the foot of the Langdale Pikes, the campground has a selection of grassy pitches for tents and hook-ups for campervans, as well as a few wooden pods with heating and lighting for the winter months. The campground is an excellent location for starting some of the best walking trails in the valley, like Blea Tarn and the Langdale Pikes. Phone service is sparse here, but you can head down to the pub at Old Dungeon Ghyll for a pint and pub dinner before cosying up in your tent for the night. There’s even a shop onsite selling basic food and camping supplies along with hot croissants in the morning. We’d recommend walking to Blea Tarn for sunrise for a morning you won’t forget. Getting there: From Ambleside, head towards Great Langdale. Follow the road through the village then take a signposted road to the left down to the campsite. Food & Drink: There is a shop onsite selling basic food supplies, or head to the Old Dungeon Ghyll, Stickle Tarn or the New Dungeon Ghyll for a pub dinner. Mountains on mountains. On a still and clear day, you’ll be lucky to see a perfect reflection of the Langdale Pikes projected into Blea Tarn, and it is a sight that will certainly take your breath away. This little tarn at the foot of the hills is a highlight of the Lake District and also one of the most easily accessible sites, with a carpark on the adjacent road. It is a gentle walk around the tarn, or head up the hillside to Side Pike for a more strenuous walk with views across to the Pikes and looking down on the tarn. Getting there: From Ambleside, follow the A593 before taking a narrow road to the right towards the tarn. The carpark is on the right-hand side. Food & Drink: Nearby food options are the Old Dungeon Ghyll, New Dungeon Ghyll, National Trust pub Sticklebarn, or head back towards Ambleside and visit the Three Shires Inn. Newly opened in June of this year, Fellpack is situated in the town of Keswick and specialises in healthy and hearty food, all of which is made fresh and on-site. The menu is small but substantial, with a range of ‘Fellpots’ such as ‘8-Hour Braised Beef Chilli’ or ‘The Winter Mac’ (mac ’n’ cheese with a winter twist! ), as well as salads and grilled flatbreads with whatever filling you like, or baguettes and wraps that can either be eaten onsite or taken away to enjoy in the hills. Fellpack also serves hot drinks and sweet treats, in a cosy and welcoming atmosphere making it the perfect place to enjoy a brew and a brownie while plotting your day’s adventures, or to cosy up by the fire with a glass of wine after a ramble over the Lakeland fells. The cafe has a beautiful array of photography upstairs and is planning on hosting events in the future. We’ve also been swooning after their beautiful crockery… go visit to see what we’re talking about! Getting there: Fellpack is situated on Lake Road in the heart of Keswick. Opening times: Monday and Wednesday 10am to 4pm, Thursday to Sunday 10am to 9pm, closed Tuesdays. Menus: See the daytime menu here and the evening menu here. The Old Man of Coniston is one of the Lake District’s most iconic hikes, and it’s not hard to see why. Technically classified as a mountain, the Old Man sits tall at 2,634ft and requires just under 4 miles of hiking to reach the summit. It is a varied walk, beginning in Coniston village before arriving at the beautiful Coppermines area. Once you reach Low Water, the feeling of being truly surrounded by mountains sets in. The remainder of the walk is steep and follows rough terrain, but views from the summit are spectacular. There are a number of paths you can follow to descend. Getting there: Park in Coniston village. There is a pay and display carpark in the village centre or some roadside parking. Route: It is a relatively straightforward track to the summit of the Old Man if following a map. Either take the same route back or descend past Goats Water, then following Walna Scar Road to Bowmanstead then back to Coniston. Alternatively, link with a longer walk over Dow Crag. Use OS Map OL6 or find an easy route option here. Gear: Bring a warm jacket, even in the summer, as the weather can be unpredictable. We’d recommend walking boots due to the rough terrain heading towards the summit. Food & Drink: Bring plenty of food and water for the walk, there are a number of cafes and pubs in Coniston on your return. 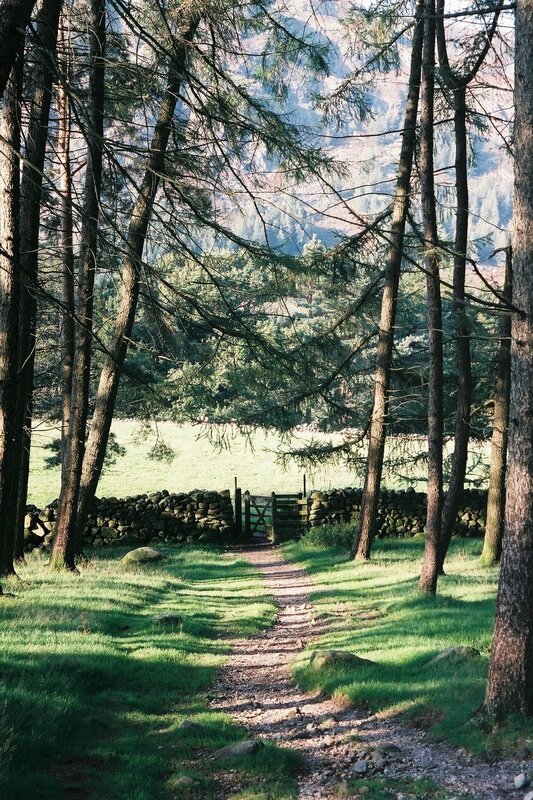 Starting from the village of Ambleside, there are a number of walks ascending into the hills. This is a shorter version of the Fairfield Horseshoe, hiking up to Dove Crag from Ambleside then descending via Sweden Bridge. Climbing out of the village, views back onto Lake Windermere and the surrounding hills become clear and are truly breathtaking. The walk follows a craggy ridgeline in the heart of the hills, a fairly gradual ascent with some more difficult sections. Cairnstones mark the summit of Dove Crag. Descending via Sweden Bridge is gentle and sheltered and beautifully scenic. Getting there: Ambleside sits on the A591 and is easy to reach from the M6. If getting the train to Windermere, it is then possible to take a bus to Ambleside. Route: Find our ViewRanger map of the route here or use OS Maps OL5 & OL7. Gear: We’d recommend boots for this hike as the terrain is rough at times. Definitely bring a windproof coat and warm clothing as the weather can be unpredictable when high up. Food & Drink: Bring plenty of food and drink for the hike. Ambleside has a wide selection of cafes and pubs upon your return. Located in the town of Windermere, Homeground Coffee + Kitchen is the perfect cosy cafe serving specialty coffee, an extensive all-day brunch and light lunch menu, and one of the best cake selections we've come across. Everything is made in-house - from the jams to the sauces - and ingredients are sourced from local farms and traders. Stop for breakfast before a hike or sit outside on a sunny day and enjoy a coffee and generous portion of Homeground cake. Getting there: Windermere is situated just off the A591 at the southern end of the Lake District. There is roadside pay & display parking, or park at Broad Street carpark, just round the corner from the cafe; £3 for 2 hours. There is a train station in Windermere with direct train service from Lancaster. Opening times: Open 9-5 everyday. Kitchen open 9-3 weekdays and 9-4 weekends. Visit the website for more information. Famously known for being one of Wainwright’s favourite walks, Blencathra is slightly isolated from the rest of the Lakeland fells and makes for an excellent ramble from the village of Scales, linking with Sharp Ridge if you’re looking for something a little more adventurous. Rising out of the green pastures of Threkeld, Blencathra’s sweeping curved lines offer spectacular views of the surrounding hills and valleys, looking down into the lush, green valley with a glimpse of Derwent Water in the distance. Getting there: Park in the small village of Scales to begin a walk onto Blencathra. Route: There is a good, circular walk from Scales heading up to the summit of Blencathra, then around Scales Tarn before descending back to the village. Find our ViewRanger map here or use OS Map OL5. Food & drink: The White Horse Inn is a lovely local pub to get a drink at the end of the walk. Otherwise head back into Keswick where we recommend Fellpack for hot, hearty meals, coffee and cake, the Square Orange for a glass of wine and tapas-style dining, or Merienda for an evening meal. Gear: As always in the Lake District, we recommend wearing walking boots and bringing waterproofs and warm clothing as the weather can be unpredictable at the summit. One of the Lake District’s most popular and famous mountains, Helvellyn is situated in the Northeastern part of the Lake District not too far from Keswick. This particular route starts from the carpark in the village of Glenridding and follows an easy scramble on Swirral Edge to the summit, returning via the famous and extremely photogenic Striding Edge. The ascent offers stunning views of Ullswater and the surrounding hills, while the two edges make for a slightly more interesting and fun route. Getting there: Glenridding is situated at the bottom of Kirkstone Pass (A592) on the banks of Ullswater. Route: Use OS Map OL5 or follow our route on ViewRanger route here. Gear: We recommend relatively light and flexible walking boots/shoes due to the scrambly sections. Always bring warm clothing and a raincoat as the temperature will drop significantly at the summit. Food & drink: Head over to Keswick and check out Fellpot Cafe for a hearty post-hike dinner and drink. Alternatively, visit The Orange Square for tapas-style dining or Merienda for a more upscale evening meal. Situated in a secluded location on the Lingholm Estate, Lingholm Kitchen and Walled Garden is a floral oasis and coffee shop; serving hot, warming drinks, delicious treats like Vegan Brownies and Pistachio and Polenta cake, and a range of locally-sourced food - from deliciously filled sandwiches to hot and tasty meals like Pork Croquette or Chickpea Fritters. Alongside the cafe, there is a beautiful garden with an array of Spring foliage, a flower-filled glasshouse and even a few grazing Alpaca. In fact, the walled garden was the inspiration behind Mr. McGregor’s garden in Beatrix Potter’s The Tale of Peter Rabbit; and indeed, you can almost visualise a cheeky rabbit in a blue coat munching cabbages, with the angry farmer waving his garden rake in despair. Lingholm is the perfect location to enjoy your lunch in the Keswick area of the Lake District; sit inside in their beautiful greenhouse, dating back to the late 1800s, or enjoy the more contemporary cafe area, with a 100ft glass wall that looks out onto the garden and Skiddaw in the distance. Alternatively, get your lunch to take away and head up to nearby Catbells to devour it at the summit. Getting there: By car - The Lingholm Estate is just a 10 minute drive from Keswick, with parking on side. By foot - Enjoy a leisurely 2 mile walk from Keswick to reach the cafe, or link with a longer walk up Catbells and around Derwentwater. By boat - From Keswick, take the Motor Launch anti-clockwise around the lake and get off directly at Lingholm. See summer timetable here. You could then jump back on the boat and enjoy a cruise around Derwentwater. Find fares here for a full day, one or multiple stops. Opening times: The cafe is open 7 days a week, from 9am to 5pm, however lunch is stopped serving at 3.30pm. Afternoon Tea is served from 1pm to 4pm and must be booked 24 hours in advance. “I wandered lonely as a cloud”, proclaimed Wordsworth in his 1807 poem ‘Daffodils’, inspired by a ramble on the shores of lovely Ullswater. It's not hard to understand why Wordsworth was so enamoured by this part of the Lake District, where rolling and craggy peaks line the shores; a vision of grassy farmland, dry-stone walls and the blue waters of Lakeland's second longest lake. The Ullswater Way is a 20-mile hiking trail that runs right around it, that can be walked as a whole circuit over two or three days, or in sections by catching a bus or the Ullswater Steamer (that has various stops around the lake). If staying in this part of the Lake District, we highly recommend grabbing your boots and rambling a part of the trail. Getting there: Ullswater is situated just off junction 40 on the M6. Walks: See our full walking guide to a part of the Ullswater Way from Howtown, crossing over Place Fell with wonderful lake views. Stay: We'd recommend a stay at Another Place when visiting the area. We're still exploring the Lake District and discovering great places to share with you.